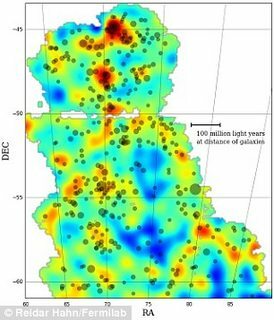 Researchers on the Dark Energy Survey have created the first map of the distribution of dark matter across the universe. 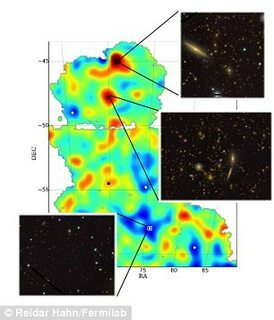 Experts who created these series of maps says that these are the largest maps ever created at this level of unprecedented detail and will improve our understanding of dark matter and its role in the formation of galaxies. The analysis of the clumpiness of the dark matter recorded on maps should also help astronomers to uncover the nature of dark energy which is believed to be the cause of the universe’s expansion and it is also the ultimate goal of this study. The new maps were released at the April meeting of the American Physical Society in Baltimore. 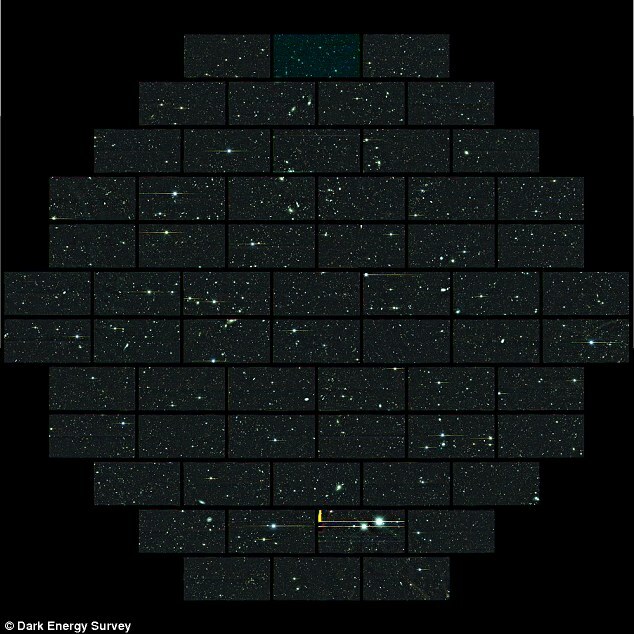 The maps were produced from data captured by the Dark Energy Camera, a 570 megapixels device mounted on the Victor Blanco telescope in Chilean Andes. Dark matter is a hypothetical form of matter, its a mysterious substance that makes up 27% of the universe it is invisible even to the most sensitive astronomical instruments because it does not emit-or-block light, but its effects can be seen through gravitational lensing – the distortion that happens when the gravitational pull of dark matter bends light around distant galaxies. We measured the barely perceptible distortions in the shapes of about two million galaxies to construct these new maps. They are a testament not only to the sensitivity of the Dark Energy Camera, but also to the rigorous work by our lensing team to understand its sensitivity so well that we can get exacting results from it. The dark matter map released Monday 13/2015 covers only about three percent of the entire sky, creating a 3D map of dark matter – and dark energy. DES will document over its five year mission. 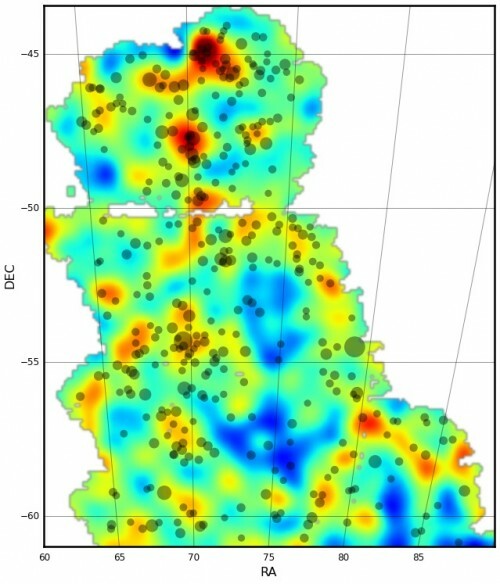 It is amazing to see a map of the dark matter over such a large region of the sky, and the full Dark Energy Survey mass map will be more than 30 times bigger still. As the project progresses, scientists hope to test current theories about dark matter. Those theories suggest that, since there is much more dark matter in the Universe than visible matter, galaxies will tend to form where large concentrations of dark matter (and hence stronger gravity) present. So far, the DES analysis backs this statement: the map showing large filaments of matter where galaxies and galaxy clusters lie, and cosmic voids where there are few galaxies. Our analysis so far is in line with what the current picture of the universe predicts. Zooming into the maps, we have measured how dark matter envelops galaxies of different types and how together they evolve over cosmic time. We are eager to use the new data coming in to make much stricter tests of theoretical models. Over the next three years or so, through the work of the DES, while there’s no guarantee all the secrets of dark energy will be unlocked, should learn a lot more about this mysterious force. I have observed a gravity-driven liquid vortex in a configuration limiting its major developments to proceed mostly in two dimensions in the upper thin liquid surface. The main question I was searching for an answer was – if the liquid vortex and the cosmic black hole vortex are similar, then what can I learn about the black holes from it? I have presented my summarizing notes on this matter at my page at Linked In and would like to show a couple of most intriguing points here. Scrutinizing the vortex pulling-in phenomenon produced a shocking grasp. • The liquid vortex developed structures very similar to the galaxy geometries when a handful of the dry shredded leaves was spread over the water surface. • The liquid vortex evidently was sucking both the foam and floating leaves and certainly the upper liquid surface layer. If this or similar phenomenon takes place for the spinning black holes, then the black holes should be considered to pull-in not only the material objects but also the spacetime itself whirling around the black hole in the same way as water whirls while flowing into the liquid vortex. • Being pulled into the black hole the nearby sections of the spacetime should be stretched more than at remote locations. Which could be observed by monitoring the wavelength of the cosmic microwave background in proximity to the supermassive black holes (expected to increase). • the black energy – at the galaxies periphery, where the pulling-in force diminishes, the still keeping on centrifugal force of the spinning spacetime accelerates the matter away from the black hole. I believe I am not mistaken with these my speculations. As per the BHSSR, the pulled-in by the BH whirling spacetime, as a spinning elastic thin film, can modify the radial and angular distributions of the shear stress and the actual force defining the (regular) mass rotational velocity. Which will depend on the spacetime media “fluidity” in the same way as it depends on the water fluidity for the LV. Obviously, the spacetime “deformation” depending on the BH activity, may extend far beyond the disc of the observable regular mass and appear as an external halo influencing the galactic dynamics.